Mix sugar and gelatin in 2-quart saucepan. Beat eggs and egg yolks until thick and lemon colored, about 5 minutes. Stir eggs into gelatin mixture. Heat just to boiling over medium heat, stirring constantly. Remove from heat; stir in mangoes, brandy and almond extract. 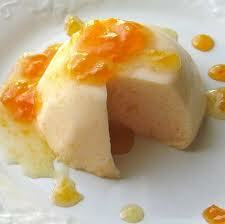 Refrigerate just until gelatin mixture mounds slightly when dropped from a spoon, about 1 ½ hours. Beta whipping cream in chilled bowl until stiff. Fold mango mixture into whipped cream. Our into 8-cup mold. Refrigerate until firm, about 4 hours; unmold. Garnish with mango slices if desired. 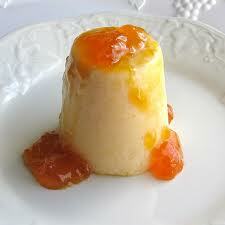 Apricot Mousse: Substitute 1 can (30 oz.) apricot halves, drained, for the mangoes. Place apricots in blender container; cover and blend on high seed until smooth, about 1 minute. Decrease sugar o ¼ cup. 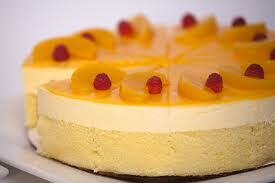 Peach Mousse: Substitute 1 can (29 oz.) apricot halves, drained, for the mangoes. Place peaches in blender container; cover andblend on high seed until smooth, about 1 minute. Decrease sugar o ¼ cup.